People come to Breckenridge for the winters, but stay for the summers! Escape the heat and enjoy fresh mountain air and a host of summer activities! Prices starting at just $82 per night! 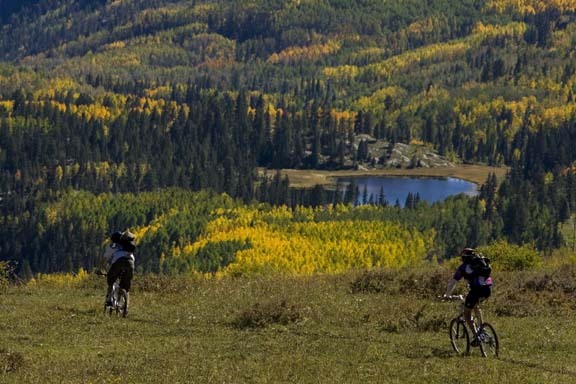 Breckenridge has a wide variety of activities for the whole family. The Summer Fun Park operates at the base of Peak 8 daily from 9:00 a.m. - 5:00 p.m. Follow Ski Hill rd. from town to the base area or ride the FREE bus from town. Ample parking is available. Summer trail maps are available at the base area and Vista Haus. Prices subject to change. Operations are weather dependent. Please call 800.789.7669 for more information. Activity Pass. All-Day Activity Passes are available for $42 per person. The pass includes unlimited usage of the SuperSlide, SuperPutt, Colorado SuperChair, and bike transport on the Colorado SuperChair. The Activity Pass does not include bike rental and is based on availability. Participants under the age of 18 need a parent or guardian's signature on release form. SuperSlide. Ride the famous SuperSlide! Try one of the two slalom courses or the steeper giant slalom track with multiple dips for the more experienced rider. The sleds seat an adult and small child. Children under the age of 18 need a parent or guardian's signature to participate. Mountain Biking. Bring your bike along and enjoy! Children's Center. The Peak 8 Children's Center is open daily. Reservations are required for daycare. Call 970.453.3258. Breckenridge Music Festival. An annual summer festival featuring two acclaimed orchestras, the Breckenridge Music Institute (BMI), Breckenridge Festival Orchestra (BFO), and the National Repertory Orchestra (NRO), performing in the beautiful Riverwalk Center in Breckenridge, Colorado, high in the Colorado Rockies. The festival starts each year in late June and ends in mid-August, with a wide variety of concerts and other musical events. Backstage Theater. A long-standing tradition in Breckenridge, come see these talented local actors perform live off-Broadway. For more information and performance dates, please call 970.453.0199. At BreckenridgeRental.com, we specialize in online booking, bypassing the costs associated with reservation centers and management companies. Book today via our secure online reservation system and save on your Breckenridge Rental. Book online and save 3% reservation fee!